I bought the frame at Hallmark, but you could use one that you already own. I wanted to frame a sentiment that was wedding appropriate so it could be used as-presented now and used to frame a photograph later without feeling guilty. 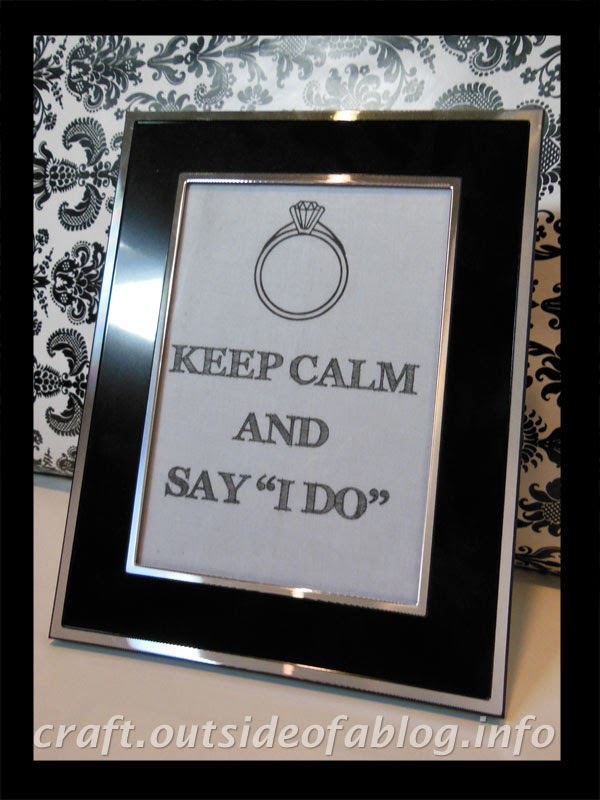 My solution was to format a 5 by 7 text box in a Word document with the phrase, "Keep calm and say 'I Do'" (font: FFF Tusj). I also inserted a clip art image of a ring at the top. I formatted the text box with no fill, but a border line. Then I printed my document on sew-in computer printer fabric, the same kind I used to make the labels for my Simple to Sew Crayon Pouches. After printing, I cut it out on the border lines, inserted it into the frame, and admired this quick and easy bridal shower gift.